My attention was recently drawn to a Google+ post by JerWei Zhang where he evaluates 2^3^4 in various packages and notes that they don’t always agree. For example, in MATLAB 2010a we have 2^3^4 = 4096 which is equivalent to putting (2^3)^4 whereas Mathematica 8 gives 2^3^4 = 2417851639229258349412352 which is the same as putting 2^(3^4). JerWei’s post gives many more examples including Excel, Python and Google and the result is always one of these two (although to varying degrees of precision). What surprised me was the fact that they disagreed at all since I thought that the operator precendence rules were an agreed standard across all software packages. In this case I’d always use brackets since _I_ am not sure what the correct interpretation of 2^3^4 should be but I would have taken it for granted that there is a standard somewhere and that all of the big hitters in the numerical world would adhere to it. A man I have a lot of time for is Joel Spolsky, author, software developer and previously a program manager for Microsoft Excel. Way back in the year 2000 he wrote an article called Things You Should Never Do, Part 1 where his main point was “The single worst strategic mistake that any software company can make is to rewrite your code from scratch.” He exemplified this principle using products such as Quattro Pro and Netscape 6.0. Not everyone agrees with Joel’s thesis and it seems that the managers at PTC, the owners of Mathcad, are among them. The last major update of Mathcad was version 14.0 which was released back in 2007 (the recent Mathcad 15.0 was a relatively minor update despite the .0 version number). To some outsiders it appeared that PTC were doing very little with the product until it transpired that what they were actually doing was an almost complete rewrite from the ground up. 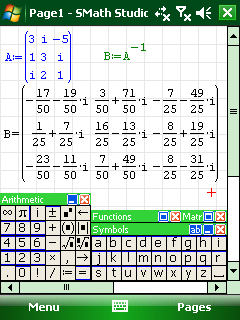 That rewrite has now been released in the form of Mathcad Prime 1.0. I don’t have my hands on a copy yet so I have been scouring the web to try and determine exactly what this new version does right and what it does wrong. Here’s what I’ve found so far. Mathcad Prime 1.0 does not have everything that Mathcad 15 has. Jackov Kucan, Director of development at PTC, has publicly stated that it won’t be until Prime 3.0 that users will be able to retire Mathcad 15 and migrate to Prime. Relating to the above point,there is a thread over at the PTC Forums where several users are calling Mathcad Prime a big step backwards. Not everyone agrees though. Another useful discussion thread is one started by PTC where they ask What new features do you want to see in Mathcad Prime? Here’s a nice demo of the new version by Jackov Kucan. The user interface looks great in my opinion although I confess to not being a fan of the Microsoft-like ribbon interface. How about you? Have you used MathCAD prime yet? If so then what do you think of it? If not then do you think you will try it? Update (16th February 2011): I was recently contacted by an employee of PTC who told me ‘﻿The internal engine has not been totally rewritten . It’s the user interface, which includes the equation editor and plots that we rebuilt from scratch.’ Thanks for the clarification. So here’s a way of using Mathematica that, I have to admit, never occurred to me. Essentially the idea is to make a big, empty graphic and then use the 2d drawing tools palette tools along with equation palettes and the ‘Evaluate in place’ menu item to produce a Mathcad-like interface. I like it! It’s a neat trick but I highly doubt that it would be enough to lure Mathcad users away from their application of choice. Any thoughts? SMath Studio is an extremely promising project that has already caught the interest of many Mathcad users (it even has basic compatibility with Mathcad’s file format) and is well worth the download. Let me know if you try it out. Update 3rd April 2010: version 0.85 is now out of date. 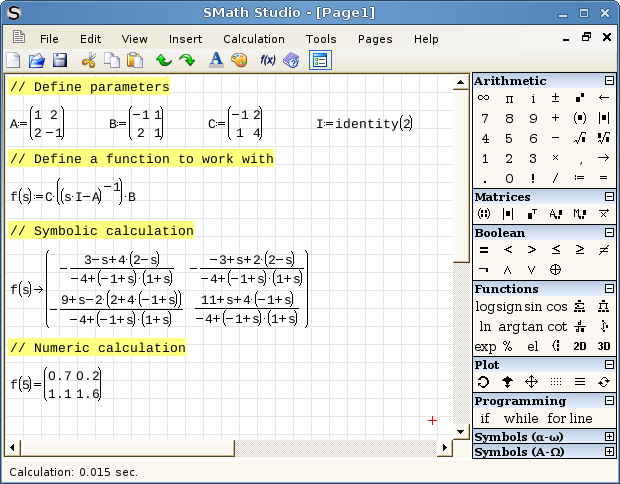 Click here for the latest version of SMath Studio.